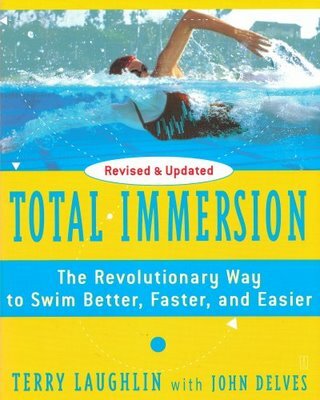 Over the past week I have been reading a book called ‘Total Immersion – The Revolutionary Way to Swim Better, Faster, and Easier‘. I’ve been read chapters 1-7, trying to absorb the information that the authors – Terry Laughlin and John Delves – provide. I’m now looking forward to getting stuck in and am sat here reading Chapter 8 which contains the first 6 drills that aim to make me a better swimmer. Will it help? I have no idea. I’ve been swimming all my life. I swam for Neath Polar Bears Life Saving club when I was younger. I also swam (for a short while) for BP Llandarcy Swimming Club – so as Laughlin points out swimming is a natural thing and I may have trained my body to have bad technique. As I plan forward and the possibility of training for triathlon events I want to get my swimming technique right. So I’m studying the methods in this book. To discuss Swimming I now have a new blog category (Swimming) – just in case anyone wants to keep up. Tomorrow’s lesson is all about learning to float again and then finding my side ‘sweet spot’. Fingers crossed it goes okay.